Currently we have branches in NSW, Queensland, Western Australia, Victoria, Tasmania and the ACT. Type your postcode into the box above to find your local branch of All Day Fencing. If no branch shows up please view the interactive map in the left menu to find your nearest branch. Currently we have branches in NSW, Queensland, Western Australia, Victoria, Tasmania and the ACT. What type of Fences and Gates do you build? All Day Fencing supply and install all fencing including, brushwood, tea tree, decorative timber, picket, paling, horizontal slat, colourbond, mesh, retaining walls, and more. We also build, supply and install automated gates. All Day Fencing can supply all fencing materials including automatic gate motors, brushwood, tea tree and custom made timber and steel gates. All Day Fencing branches can be paid via direct transfer, cheque or cash. Credit Card payments are accepted via Paypal on our website: www.alldayfencing.com.au/gates#order. Payments received for onsite work, in full, on the day of completion are offered a discount. All Day Fencing branches carry a minimum contractors licence as approved by the state authorities. All Day Fencing branches are independently owned and operated. Each branch carries Public Liability insurance and Workers Compensation insurance. Please email your local branch for up to date details. All Day Fencing branches do all work from small jobs to the larger projects. Residential, Commercial, Civil, Rural. Small jobs can be done at an hourly rate plus a charge out fee. Emergency after hours work is available in some areas. All Day Fencing branches service residential homes, builders, real estates, project managers, strata managers, architects, landscape designers and more. Do you repair fences and gates? All Day Fencing can repair or replace your existing fencing. Small jobs will be done at an hourly rate plus a service fee. Do you guarantee your fences and gates? All Day Fencing provide a 6 year guarantee on all labour and a 12 month guarantee on all materials. What hours/days are you open? All Day Fencing office is open from 9:00 am to 5:00 pm Monday to Friday. Quotations can be booked on the website 24/7. Do you provide an onsite Quotation? Yes, All Day Fencing provide an onsite quotation for all areas we service. View our local branch map for your nearest branch. Do you write a quotation on the spot? Yes, we try to provide a written quotation before we leave where possible. What days/time do you offer quotations? All Day Fencing try to provide a quotation service between 10:00 am and 3:00 pm Monday to Friday although we do some quotes on Saturday mornings when available. All quotations are valid for a period of 90 days. After this time the quote may be subject to an increase. Do I have to attend when you quote? You do not have to attend the quotation as long as you have left sufficient information, job description and your contact numbers. Do you offer a discount for prompt payment? Yes, customers are offered a discount for payment on the day of completion. Do you bill both neighbours seperately? No, we can only make a contract with the one person (or entity). It is your responsibility to seek payment from your neighbour. What are the laws regarding dividing/boundary fences? For more information on fence laws and definitions please review our section on the 'Dividing Fences Act' under 'fence laws' in the above menu. What height can I build my side and back fence? 1.8m is the standard. If both neighbours are in agreement the fence can be constructed higher than 1.8m. If the ground is different levels on either side of the boundary, the height is measured from the higher ground level. What height can I build my front fence? Does my fence have to be on the boundary? No, in some cases it is not possible to locate a fence exactly on a boundary. This may be due to a cliff face or other natural feature. The dividing fence can be located in a position both neighbours agree to. Both neighbours are still obligated to the maintenance of that fence. Does my neighbour have to pay half? In general ,your neighbour is obligated to pay half of the cost of the maintenance of a dividing fence. Review our section on fence laws for further information. Does my fence include retaining walls? In general ,no, your fence does not include retaining walls. Review our section on the Dividing Fences Act for further information. If I change my fence does my neighbour pay half? Your neighbour is obliged to pay for half of the maintenance of the existing fence. If the fence is beyond repair your neighbour is obliged to pay half for the replacement of the same type of fence. If you want to change the style or construction of the fence, your neighbours will have to be in agreement but you will have to meet the extra cost. I am building a new home, does my neighbour pay towards the fences? If you are building a new home (or seriously renovating), and require to replace the fencing you can only do so with council approval or neighbour agreement at your cost. Do I have to have a fence if I don't want one? No, you are not required to have a fence if you do not want one. For more information review our section on fence laws. If I have to have a fence, what is the minimum fence? A sufficient fence is one that is deemed to stop the trespass of cattle and sheep. In the city areas it is reasonable to build a fence that is capable of containing pets such as dogs. What are the laws regarding pool fences in my state ? The laws for swimming pool fencing varies from state to state. Please view our section on Swimming Pool Regulations for links to all state laws and legislation. What height do I build my pool fence? 1.2 m is the standard height for swimming pool fencing. The laws for swimming pool fencing varies from state to state. Please view our section on Swimming Pool Regulations for links to all state laws and legislation. What materials are good for a pool fence? Pool fencing can be constructed from any material as long as it complies with the relevant pool fence laws in your state. The most common materials are brushwood, glass and tubular steel. Do I need a pool fence for an older pool? In some cases a pool fence is not required (although strongly advised) if your pool was built before a certain date. Swimming pool fence and barrier legislation is set by each state government. Please view our section on Swimming Pool Regulations for links to all state laws and legislation. My neighbour is the council, will they pay half for the fence? No, the dividing fences act excludes crown land from being bound by the terms of the Dividing Fences Act. Do I need council approval for my fencing? Do I need council approval to replace my existing fence? In short, no, you do not need approval to replace a fence with the same size and similar construction. If in doubt consult your local council. How high can I build my fences? In general, you do not need approval for side fences under 1.8 m, or front fences under 1.2 m.
Can I build a fence higher than 1.8 m without approval? In general, if both neighbours are in agreement you may build your side or back fence higher than 1.8 m.
What is my neighbours obligation regarding the boundary fence? I have notified the neighbour, built the fence but they won't pay? Serve your neighbours with a notice to pay. If they fail to pay you may seek action in your local court. I have a block of units next door, who pays for fencing maintenance? You may serve the Strata Body a notice of intention. The building may be managed by an external strata management company. You must address your correspondence to the Strata number. I am not with speaking terms my neighbours,What can I do? A well drafted letter outlining the work to be done and including a copy of a quotation for the work should be sent prior to any work proceeding. My land is beside council owned land,will they pay for half? My neighbour doesn't want a fence but I do? If you do not want a fence you are not obliged to have one. If you want to build a fence where no fence exists you may apply to your local council or failing that local court. I want a new brush fence to replace my paling fence, who pays? If the dividing fence is in disrepair and needs to be replaced both neighbours are obligated to share the cost of replacement for the same type of fence. If one of you would like a more expensive style of fence, for example brushwood, you are obligated to pay the difference. I had the fence built and my neighbour won't pay? You must approach your neighbours regarding payment for any fencing work before you have the work done. If you have built a new fence without your neighbours agreement you may not be able to receive any money. The best way to avoid neighbour disputes over fencing is to notify them of your intentions in a series of letters prior to the job proceeding. Failling this you may take the matter to the local court for determination. I have several neighbours, do they have to contribute to the cost? You must approach your neighbours regarding payment for any fencing work before you have the work done. If you have more than one neighbour then you must seek seperate written quotations for all the sections of fencing required. What is the best type of fencing to reduce noise? You must approach your neighbours regarding payment for any fencing work before you have the work done. If you have more than one neighbour then you must seek separate written quotations for all the sections of fencing required. How can i reduce noise from my street? Generally a mixture of hard and soft surfaces do the most to break down noise. Brushwood fencing is an excellent absorption material and is used in townhouse developments to reduce reflected noise. It is also very good at absorbing road noise however sound will still travel over the fence. What noise reduction can I expect from a fence? What fencing offers best security? Vertical steel bar fences with no foot holds built to a minimum of 2.1 m high with barbs on top is a suitable secure fence. Brick or block fencing can add protection and privacy. For industrial uses chain mesh fencing offers security and cost efficiency. Do you install security gates? All Day Fencing supply and install automatic security gates in both 240 volt or solar powered. Auto gates add security and peace of mind. Can I build my fence higher than 1.8 m for privacy? Privacy is a two way thing. If you can see your neighbours from your home then they can see you! Usually when a privacy issue exists both neighbours can agree and build a privacy screen to the agreed height. If one party wants a fence higher than 1.8 m and the other party does not you must apply to council for permission, or build a screen on your side of the fence, 900 mm from the boundary. Screening plants can also be considered. Do you supply auto gate kits? All Day Fencing can supply all fencing materials including automatic gate motors and custom made timber and steel gates. Purchase online at our web-store. Delivery takes around 3 days to most capital cities. Do you manufacture and install timber and steel gates? All Day Fencing can build, supply and/or install custom made timber gates. Do you manufacture timber or steel Gates? All Day Fencing can build, supply and/or install custom made timber gates. We can also supply a galvanized steel frame and hinges to the back of your gates for added strength in high traffic areas. Can you build gates to match our existing gates/home? All Day Fencing can build, supply and/or install custom made timber and steel gates to match the features in your home. Simply email a picture and we will draw a design to suit your home! How do I order a custom made gate? 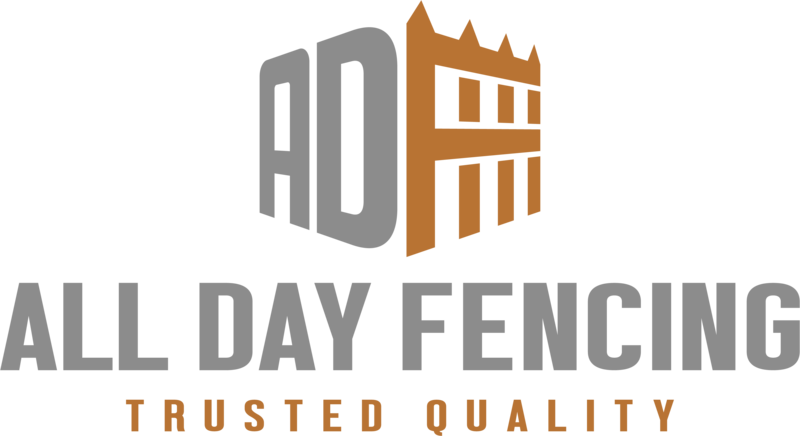 For the quickest service, Custom Gates can be ordered online at our website: www.alldayfencing.com.au/gates. You can order one of our gate designs or send us a picture or plan of your designs. Do you build and install sliding gates? Yes, we manufacture, supply and/or install sliding gates for most applications. How do I get a quote for a custom made gate? For the quickest service, get a quote on your custom gate design at: www.alldayfencing.com.au/gates. You can order one of our gate designs or send us a picture or plan of your designs. For the quickest service, Custom Gates can be ordered online at our website: www.alldayfencing.com.au/gates. A deposit is required and the balance paid prior to delivery. Can you install auto gate motors to our existing swing gates? Yes, we can automate your existing swing gates or build new automated gates, View our auto gates website at www.adfautomation.com.au to purchase online. Can you supply auto gate kits which I can install myself? All Day Fencing supply DIY auto gate kits and accessories at: www.adfautomation.com.au. Can you motorise sliding gates? Yes, we can automate most sliding gates, we can also build and install automated gates. View our auto gates website at www.adfautomation.com.au to purchase online. Do you supply accessories like remotes,Keypads? Do you service remote control gate motors? Yes, we can service our range of auto gate motors. View our auto gates website at www.adfautomation.com.au to purchase online, or for more information. How long is the delivery for the DIY gate kits? Yes, we can send our DIY gate kits to most areas Australia wide in 3 days. View our auto gates website at www.adfautomation.com.au to purchase online, or for more information. Can my gates be solar powered? Yes, we can supply and install solar panels for your auto gates. View our auto gates website at www.adfautomation.com.au to purchase online, or for more information. What is best Solar or 240 volt? Solar power costs more to purchase but in some cases it is cheaper than the power option because of the availability of power. Solar gates can be pushed open by hand whereas 240 volt powered gates are secure when closed. Both can be fitted with electric power locks and a range of accessories. What type of gate openers do you sell? We offer several models of gate controllers for gates from 100 kg to 400 kg. You can automate swing gates, (1 or 2) and sliding gates easily with our system. Both systems can be powered by 240 volt or solar panels. What accessories are available with your auto gate systems? We offer several accessories including, security entry keypads, remote electric beam detectors, security keyswitch, solar panels, electric locks, remote controls and more at www.adfautomation.com.au. Do you manufacture and install automated gates and fencing? All Day Fencing can build your new automatic gates and install them. What is Brushwood and where does it come from? Brushwood 'Melaleuca Uncinata' grows prolifically around the center of the country. It is carefully harvested to promote regeneration. The harvested sticks are used to make brushwood fences, screens, panels, thatch and other products. Brushwood carries a high salt content protecting it from the harsh Australian climate and when made into a fence, can last up to 25 years. Can anyone build a Brushwood fence? Brushwood fencing requires the use of specially trained contractors. The skill in producing a good brushwood fence is only gained from years of experience. Brushwood is made into panels for ease of installation, however it limits the use to level and square situations. How high can I build a brushwood fence? Brushwood fencing is similar to weaving. Hand made brushwood can be made to any shape, height or size. What finishes are available for brushwood fencing? Traditional brushwood fencing is finished with a 130 mm to 160 mm diameter 'Roll Top Capping'. Brushwood fencing can be trimmed straight and a timber or colourbond capping can be fitted. Brushwood fencing can also be left with the bush ends left untrimmed. This is often called a 'Zulu Top'. Can you repair brushwood fencing? Brushwood fencing can be repaired including the installation of new 'Roll Top' cappings. If your brushwood is over 17 years old the brushwood can be replaced using the existing steel frame. How long does brushwood fencing last? Brushwood fencing has an average lifespan of 20 years although the cappings should be redone every 7 to 8 years depending on the exposure. Do you build brushwood fences? All Day Fencing can build, supply and/or install brushwood fencing to all areas. DO you sell brushwood supplies? All Day Fencing can supply brushwood by the 25 kg bundle for fencing or roof thatch. We also supply prefabricated brushwood panels, steel pipe, gal wire and bases. Can you use brushwood for roof thatch? All Day Fencing supply brushwood bundles and wire for the hand thatching of pergolas, gazebos and huts. Do you supply brushwood for roof thatch? All Day Fencing supply 25 kg brushwood bundles and wire for the hand thatching of pergolas, gazebos and huts. Do you install roof thatch? All Day Fencing install roof thatch to pergolas, gazebos and huts. How long does tea tree fencing last? Tea tree fencing has an average lifespan of 20 years depending on the exposure. How are tea tree fences constructed? Tea tree fencing is constructed using 50 mm square steel posts and three horizontal fence rails. Where can I buy tea tree sticks? All Day Fencing supply 25 kg bundles of tea tree sticks. Each stick is 1.8 m high and each bundle contains enough sticks to cover 900 mm wide. Tea Tree can be ordered online at www.oznative.com.au. Tea Tree can be delivered to Brisbane, Sydney, Canberra, Melbourne and Adelaide. Treated pine is a softwood that has been pressure treated to prevent insect attack and rot. Is treated pine poisonous around children? Yes, treated pine is treated with copper sulfate which is a poison. Treated pine is not recommended for children's playground equipment. See our treated pine information page. What standard heights does timber paling fences come in? Treated Pine comes in standard heights of 1.5 m, 1.8 m, and 2.1 m (5', 6' and 7'), Hardwood is only available in 1.8 m heights (6'). Are steel and timber posts the best? Treated Pine is a softwood and even though it is sufficiently treated for outdoor use it still contains the potential to warp, bend or bow after installation. For this reason we prefer the use of 50 mm square steel posts. Hardwood posts are banned for use in ground as they attract insects and rot very quickly. Are steel or timber posts the best for treated pine? Treated Pine is a softwood and even though it is sufficiently treated for outdoor use it still contains the potential to warp, bend or bow after installation. For this reason we prefer the use of 50mm square steel posts. How many rails do you need for treated pine fencing? For fence heights between 1.5 m and 2.1 m, three 75 mm x 50 mm fence rails should be used to keep the palings straight. Do treated pine palings shrink creating gaps? Treated Pine remains its size for many years without shrinking. As it is a softwood it does swell when wet. Are hardwood palings more durable? Local milled hardwoods are used for timber fencing where the look of hardwood as opposed to treated pine is desired. Hardwood fences 'grey' with age whereas treated pine remains a light green colour. Hardwood is used to match existing fencing. Hardwood has been prohibited for posts as they can attract insects and rot quite quickly. Steel posts are used or if a timber look is required hardwood fences can be teamed with treated pine posts. Why is Lap'n'Cap paling fencing and not just standard? Lap'n'cap fencing is constructed with two layers of palings overlapped to retain total privacy. The capping provides a neat straight finish to the fence top. Standard palings can shrink causing gaps between the palings. What timbers can picket fences be made from? Decorative picket fencing can be manufactured from Australian hardwoods or pre primed and treated pine. What heights can I build my picket fence? Decorative picket fencing can be built to a height of 1.8 m. Front fences are normally restricted to 1.2 m in height unless surrounding fencing is higher. What styles of picket fencing do you build? All Day Fencing build all types of timber decorative picket fencing. We can construct your fence with laser cut pickets or custom make your own design. Can you combine entrance pergolas (arbors) with picket fences? Combine arbors, gates and pergolas with your picket fencing to create an overall theme to your home. What timber can be used for horizontal slat fences? All Day Fencing construct horizontal slat fencing from Australian Hardwoods and pre primed treated pine. What sized timber can be used for horizontal slat fences? All Day Fencing construct horizontal slat fencing from 42 mm, 66 mm and 92 mm wide slats. What posts are used for horizontal slat fences? All Day Fencing construct horizontal slat fencing using 50 mm square steel posts. What type of glass fences do you install? All Day Fencing supply and install glass, semi-frameless and frameless glass fencing. What thickness glass do you use for frameless glass fencing? All Day Fencing supply and install 12 mm toughened frameless glass fencing. What colours are available for glass fence frames? Glass fencing comes in a range of colours as well as stainless steel. What handrails are available for glass fences? Glass fencing handrails can be made from stainless steel, aluminium or timber. What fittings are used for frameless glass fencing? All Day Fencing use marine grade stainless steel fittings for all frameless glass installations.